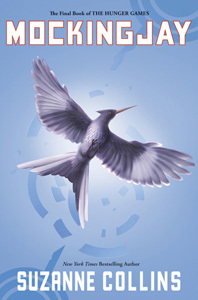 After finishing Catching Fire with that cliffhanger, I really had to go on start and finish Mockingjay. Again, a fair warning: Spoilers ahead. For context, I just finished the second book a couple of days before reading this last one. And as you can read from my recent review, that second book was so intense with a cliffhanger that completely left me hanging. So of course, my anticipation was high and I was still fresh from the intensity of the last book. Expectations have been set, so have they been met? One of the expectations was Katniss will be able to make a choice, or be forced to make a choice— Peeta, Gale or none at all. I was glad with the outcome of this, since I was actually rooting for that pairing. My thought was, “they were meant to be damnit!” And am very glad they did. The way how it all went out was depressing though, but still thought out well, considering the circumstances. Near the end, where they finally got to the Capitol and already face to face with Snow, I found it odd that everything was so convenient. Too convenient. Fine, Coin, the head of District 13 had her own agenda sure. And it was just too convenient as well that Katniss had to be unconscious while the pandemonium and matters settled1. Showing the rebellion as someone else’s plan to ascend into power is a actually a good twist, though I wonder if that idea should have made apparent more, and not have ended too quickly and neatly. Or I was just not paying too much attention. After reading the whole thing, it was like following the Spider-man movies. The first one was cool; the second one was sooo awesome it could be right there at the top of the comic-turned-movies; the third one, however, left you wanting something more, preferably a completely different turn of events. Or maybe I was just expecting too much, and hoping my expectations will be met. I still recommend this though, for closure. It’s still a good story, just not what I was expecting. And it doesn’t really bring the whole series down, since it has its own merits. And it was just too convenient as well that Katniss had to be unconscious while the pandemonium and matters settled. This is one of my major “meh” moments in the novel. Why is she always out of commission when the good stuff are happening?! Eh. Same thing for me. I loved Catching Fire, but Mockingjay wasn’t all that. It’s okay, but it’s not the absolutely awesome, at least for me.